Air Bearing Caster Information - How Is A Load Module Or Air Caster Used? CLICK HERE TO CONTACT US Load modules - also known as air casters - are used primarily to house individual air bearings and their load pads to make them ready for operation. An air bearing cannot work on its own. 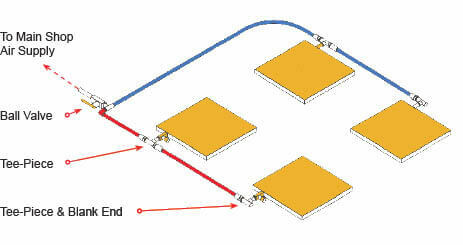 It needs a load module to cause it to receive compressed air, pressurize, and float away from the floor surface.Load modules are used in multiples of three and more and are flexible in that they can usually form a footprint of the load to be moved, and have the load applied directly on the modules and then floated off to their destination.One of the most effective uses of Hovair Systems load modules is in machinery movement. Sliding three or four modules underneath a machine is a breeze. However, some clients prefer to fix the load modules directly to their machines permanently. Then, when the machine needs to be moved, just plug in your shop air, and bingo!... it's on its way. It really is that simple.Shown to the right is a typical air caster module footprint layout showing a four-module system complete with air supply hose and tee-piece fittings back to the shop air supply.